Arrive in Florence and take a moment to breathe in the air of the Renaissance. We suggested arriving early to go for a city walk around the magnificent squares and by the illustrious Arno River. This walk starts and ends in the Piazza della Signoria and takes about 3,5 hours. After breakfast, take the local bus (with your luggage) or book a private transfer to Greve in Chianti, a rustic market village and the capital of the Chianti wine producing region. Check in to the hotel and head over to Le Cantine di Greve where you can taste over 50 different Chianti wines.Take advantage of the daylight to walk around this gorgeous scenery by choosing between two routes. After breakfast, take the local bus (with your luggage) or with a prearranged private transfer, to the marvelous city of Siena, famous for its biannual “Palio” horse race, held in the most beautiful shellshaped square in Europe: the Piazza del Campo. Don’t miss a visit to the Duomo, an architectural treasure, and numerous imposing medieval palaces. History comes alive as you meander through the narrow streets of this fantastically preserved jewel of Italy. Day 8 - Arrivederci Tuscany! Our services end after breakfast, however we highly recommend you to book extra nights in Siena to continue exploring the old centre, exquisite museums, lush galleries and marvelous churches. A visit to the top of the bell tower is also quite a sight. Florence, Pisa and Bologna airports are flown to by both major and low cost international carriers. All three airports can be easily reached by local transport, which is affordable and offers a frequent service. From Florence airport take the direct local bus to downtown. From Pisa airport, you can take either a direct train or bus to Florence. From Bologna airport take the bus to Bologna central station, then the train to Florence. To return from Siena to Florence, the SITA-TRA.IN bus station is very close to the hotel and a bus leaves every 30 minutes. If you come with your own car, please note that the hotels we use in Florence and Siena do not have a private parking lot of their own, there are several guarded parking areas which cost approximately €20 per day. Selected 2*, 3* and 4* hotels are used in this trip. Some of these hotels have swimming pool and restaurant. In all the accommodation the rooms have private bathrooms and a good Italian breakfast is included each morning. The trip is on bed and breakfast basis because throughout the trip there are plenty of opportunities to taste both the outstanding local cuisine and a wide array of prestigious regional wines. During high season it is possible that you might sleep in different accommodation to the ones that are indicated in the description. In some cases it is possible that your list of accommodation differs somewhat. This means that start or end of the routes are slightly altered. Therefore you should check to see if your accommodation is the same as that mentioned in this programme. If not, you must be alert at the start and end of the routes. In choosing alternative accommodation we have tried to maintain the same standards and quality. We have also tried to stay in the same towns and villages, in order to change routes as little as possible. 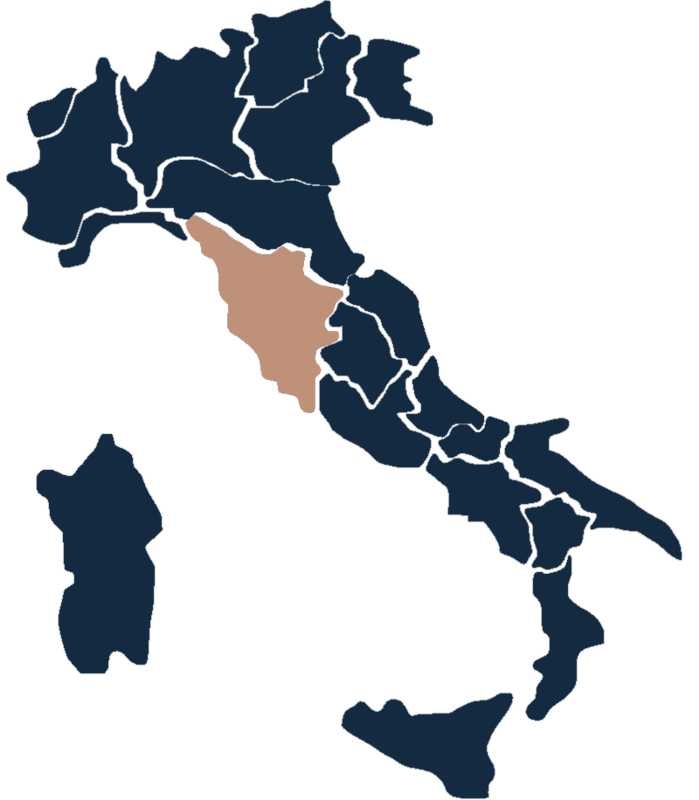 Tuscany has a typically agricultural landscape. Because the walks often pass near to, or through, towns and villages, the occasional stretch of asphalt road is unavoidable. We have done our best to keep these to a minimum, however. You will mostly be walking along so-called strade bianche (sing. strada bianca), i.e. ‘white roads’. These roads, which are paved with compacted gravel, are peculiar to Tuscany. You will occasionally meet a car on them. Certain strade bianche will be asphalted in the near future: if you come across a newly asphalted stretch, please inform us so that we can change the route or its description at that point. Apart from the strade bianche, you will also walk over smaller paths. These take you through loamy crop fields. If the weather is rainy, the paths are often muddy and the loamy clay will stick to your shoes. This minor handicap can make the walks considerably heavier going. In all trip versions Luggage transfer is included from Greve in Chianti to Radda in Chianti. You travel with your luggage from Greve to Badiaccia on Monte San Michele (start of the walk on day 5). The supplier will continue to Radda in Chianti with the luggage. If you have booked the ALL TRANSFERS version of the trip, luggage transfer is included from Florence to Greve in Chianti and from Radda to Siena. In this case you travel with the luggage. In all cases, transfers are at 9:30 hrs. from the hotel. Bags should be ready and at the reception or store room by 9:00 hrs. If you are unable to walk, you can always ask, if the luggage transporter can take you with him when transporting your baggage, but this is not always possible and sometimes you have to pay a small fee locally. In some countries there are special insurances for transporting peoples and sometimes the car is not suited for transporting persons. Self guided walking or cycling requires individuals to use problem solving skills, be adaptable and have a keen eye. It is recommended that you are comfortable map reading, referring to route notes and that you have a good sense of direction (or are willing to work on improving this!) Sometimes route finding, losing your way, finding it again and asking the locals for help is all part of the adventure. If you’ve never been on a self guided trip, after the first couple of days you will get the hang of if as the vast majority of our first time travellers attest. Please be assured that our written material issued to you for route finding is updated regularly and we provide a 7 day service hotline in the event of any problems. There is a certain level of the unknown that comes with self guided trips, however with a methodical approach potential problems will be averted. The freedom of a self guided trip is something that, once experienced, is sought time and time again. The concept behind most of our trips is active holidays and the fitter you are the more easily you will adjust and enjoy yourself. This walk is graded introductory to moderate. We expect participants to take responsibility for their fitness and preparations on a consistent basis prior to departure, and INCREASE the regular weekly training schedule in the two months leading up to departure. That way, when you start walking, you will feel relaxed and comfortable and strong, having done more than sufficient preparation for the trip. You will also have more energy to enjoy the views, take photos and explore the sights in your spare time, rather than just make it to the next hotel. During the day is when the most interesting features of interest will be found, and being fit allows you to optimize every situation you encounter. As a minimum, we recommend 40 minutes of aerobic type exercise; running, swimming, biking, hill walking, or gym work two to three times a week for two to six months leading up to your walk. Note the best training is the activity that you are actually going to be doing; walking up and down hill, and cross-country. Practice this as much as possible. Training should be stepped up as you get closer to departure, to an amount you feel appropriate (you don’t want to cause yourself an injury!). Using your gear before departure (boots, daypack, clothing, etc.) gives familiarity and comfort whilst on the walk. It makes sense to know that all your gear ‘works for you’ BEFORE departure, rather than discovering how things work or fit (or don’t!) on the trip you have invested so much in. Use the philosophy of ‘getting fit to go walking’, rather than ‘going on a walk to get fit’, to avoid problems. Turistskatter Ikke inkludert og betales lokalt hvis de lokale myndighetene krever det.